For weeks now I have been toying with the idea of changing the location of my Tuesday View. 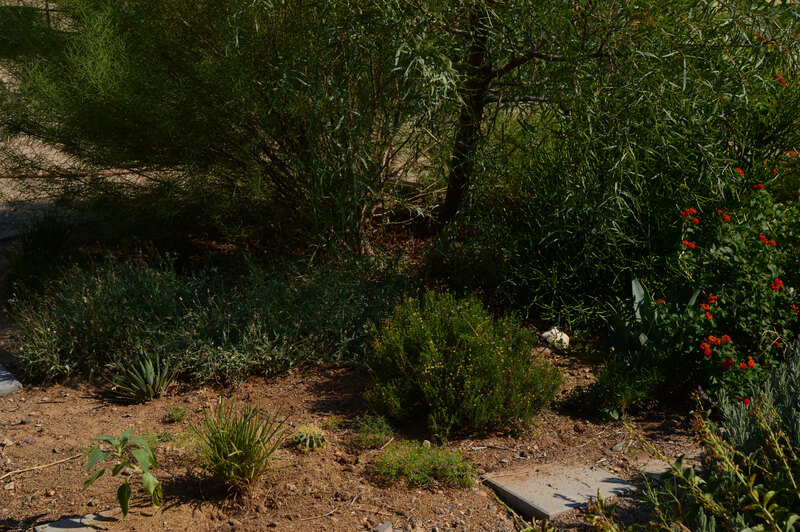 It has helped tremendously as I have tried to complete and balance the plantings in the South Border, and I've felt the need to apply a similar tactic to an extremely unsatisfactory part of the garden. May I present the East Border! As you can see, it has a fair-sized patch of empty ground, muddled plantings, and so on. There are reasons. This is the area that receives the most sunlight, and plants often die quicker than flies here. 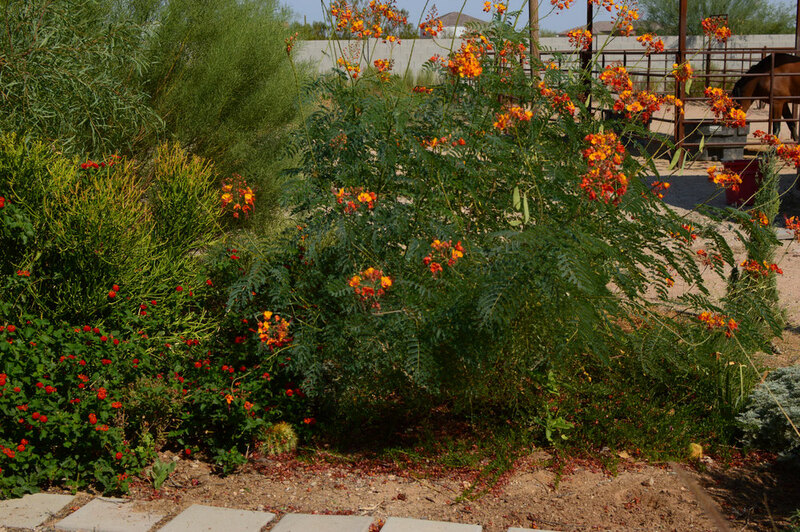 As the Senna and Acacia (both barely visible in these photos) have grown up, there has been a little shade to moderate conditions, but I am still dealing with sun-scorched plants here. In addition the soil is unequivocally clay in the East Border. Clay and nothing else, except where I have dug in patches of manure over a few brief years. 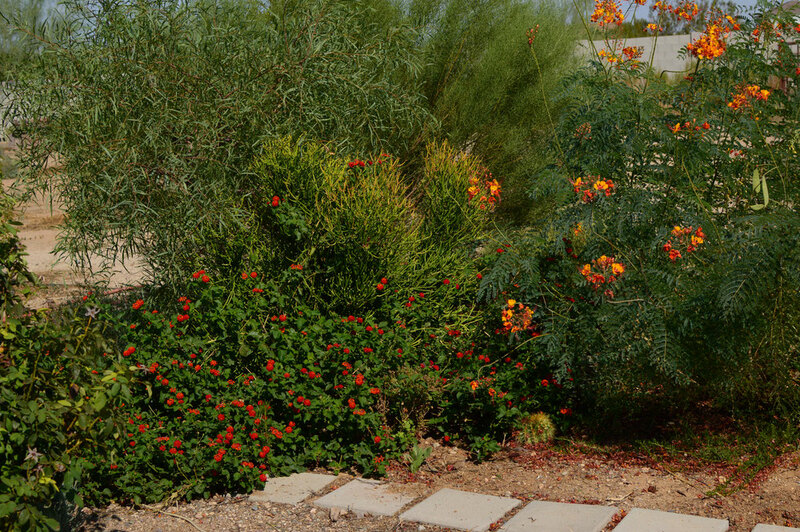 It is an area dominated by a few wildly successful plants: Caesalpinia pulcherrima, Senna nemophila, and Euphorbia tirucalli "Sticks on Fire", as well as an out-of-hand lantana "Denver Red" and the thriving Eremophila x "Outback Sunrise" growing as groundcover beneath the Caesalpinia. So it is not altogether a blank disaster, as it was during its first few seasons. Now it is mostly just a mess. With bare patches. So over the next season or two I have plans for reorganizing and renovating this border, and I thought the Tuesday View would be a good place to begin. A couple of smaller successes also exemplify this border: Aquilegia desertorum (above) and Bouteloua gracilis "Blonde Ambition" (below). One has barely survived; the other has been quite robust. The Aquilegia is my second attempt, and I believed it was gone for good when rabbits shredded the remaining stems in early summer. To my surprise a little cluster of leaves poked up from the soil some time after that, then another. It has come back fairly strongly since then, and I am very pleased but still holding my breath. 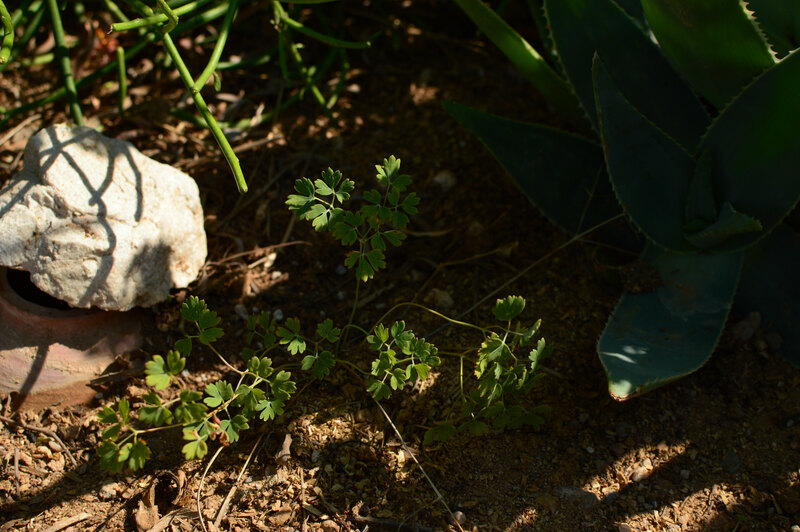 Aquilegia desertorum is a native of Arizona, but grows naturally in locations that receive plenty of moisture. I have to keep a close eye on it, as in its youth it requires nearly daily watering. I think it's worth the trouble, and I have hopes that as it matures it will become more tolerant of dry conditions. This plant went in last spring. Sadly, it seems to be available only from High Country Gardens, and from them only for spring shipping, which makes it difficult to plant it early enough to get established before the heat hits. However, if it survives through to winter, perhaps it will finally gets its roots fairly into the garden here. I hope so! The plant below is ornamental grass Bouteloua gracilis "Blonde Ambition". It has settled in and thrived despite the summer's heat, so I'm quite pleased with it. What I am not too pleased about is its location - too far to the back of the border. This is a plant I would rather see at a shorter distance, in order to enjoy its trembling motion in the breeze and its delicate colors. So I am hoping to move it once temperatures decide to stay below 100 F/38 C.
Well, I could say a good deal more about the peculiar difficulties and opportunities of the East Border. I'm sure I will say plenty of it over the upcoming months! But for now this is an introduction to what remains the most difficult section of the garden, which I hope to cajole into better form as I go on. I must add that my meme postings will probably be irregular for a while. Various projects have been mounting up, not least my project of writing at book length about the garden and plants here. I think it is time to give myself more leeway in post scheduling, but I still look forward to sharing about this new view for Cathy's Tuesday View at Words and Herbs. The East Border needs it! Another corner of the border. Chrysactinia mexicana is the small evergreen shrub in the foreground. Shade is provided by Acacia salicina. The color mix is wonderful, Amy! I'm surprised to see 'Blond Ambition' doing so well as it's struggled in my (less hot) garden but perhaps your clay soil is of benefit there - my soil is mostly sand so it doesn't hold the moisture it receives well. I too am regularly frustrated by mail order nurseries whose shipping schedules don't fit the needs of those of us in hot summer/mild winter environments. Once again I resorted to planting things in late spring or summer because that's when the plants became available and, as usual, a substantial percentage of those just died. 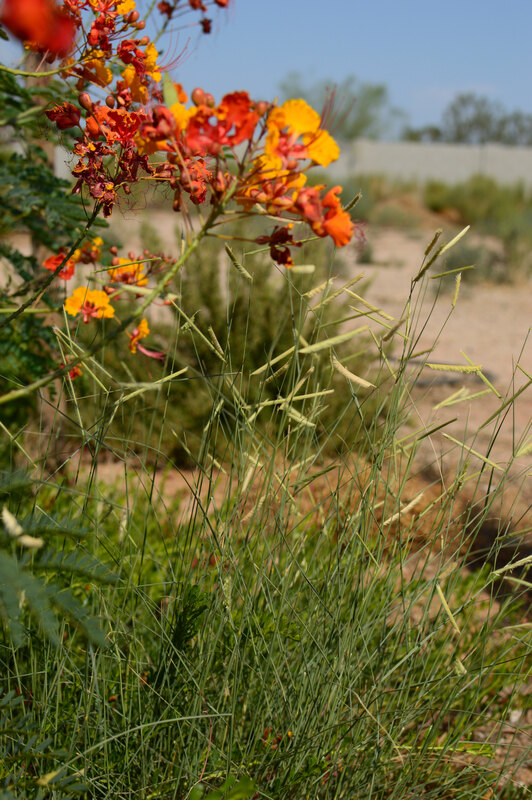 Thank you so much for your patience, Cathy :) I've learned to move plants with fear and trembling as some desert plants seem to particularly resent having their roots disturbed. But once temperatures start to drop I intend to try some of the likelier candidates in an attempt to get things better arranged. That lantana is a bit unusual, and to be honest its color varies a little with the seasons. Sometimes it looks more orange and yellow - just a shade darker than the basic varieties. But as you can see, it can also be a lovely rich red!